In response for more information on Brimtoy ‘Pocketoys’, with particular emphasis on the picture element, I have included this short post. So as not to repeat myself and become even more boring this post should be read along side my earlier Wells-Brimtoy one which included a ‘Pocketoy’ section. Pocketoys were launched in 1952 and whilst the majority of the series was based around the Bedford trucks a variety of other vehicles were included. Along side the Bedfords came what most people instantly recognise as one of the ’Pocketoy’ series and that is one of the many double decker buses the majority of which were based on the good old London red Routemaster. But the series did include a raft of other road vehicles including bulldozers, coaches, caravans etc. but as its the Bedford trucks which were the dominant factor its those that we see most often at fairs and for sale on the internet. Pocketoys, as the name suggests, were made to a size which in theory would fit into your pocket (not rocket science !) and the majority were around 3.5″ in length (89mm) although some, like the articulated lorries, were much longer. But Pocketoys were not only made to fit the pocket in terms of size they also fitted the pocket in terms of price. With prices starting from around the 2/6d mark (12.5p in todays dosh) they were relatively affordable by most, indeed I can remember many times as a young lad debating long and hard whether to blow my whole weeks pocket money on a Pocketoy or save half and spend the rest on sweets and pop ! The vehicles themselves regardless of size were either friction or clockwork driven and either of tinplate or a mixture of tinplate and plastic in construction. The model came in a simple card box with end/tuck-in flaps usually with a coloured line drawn illustration to the outer. Included would be a colour brochure detailing the models available in the series. As for the number of different models which made up the Pocketoy series ? well to be honest quite frankly I haven’t a clue. I believe in 1955 there were some 57 models featured in the Pocketoy sales brochure but when the later models were issued we are looking at models numbered 500+. Just whether that model number in fact relates to how many different models there were, somehow I doubt it very much, but I don’t have the catalogues to make a valued judgement. Despite not knowing exactly how many models were available in the series it must be quite extensive for if we take for instance the removal van which Les had bought (see comments) you can see that there were three variants that I am aware of and thats just from the earlier issues ! So if anyone out there has any Pocketoy brochures or can shed any further light on this matter please get in touch I’ll be happy to hear from you and to Les and the others I hope this extra info/pics is useful. 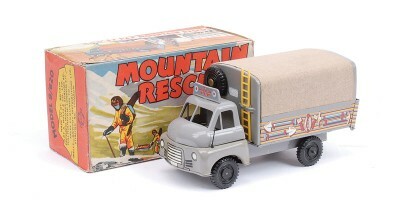 I have two of the Wells Brimtoy RAF Mountain Rescue Bedford lorries. Both are in very good condition but there seems to be a lot of extra bits for one which I am trying to find out about. I have two patients on stretches which fit on the holes inside the back, and the spare wheel held on by a spit clip above the cab. But there are two lugs next to where the spare wheel is attached above the cab – did this hold a plastic ladder which came with my purchase? Also a hole in the nearside wing – did this hold an aerial? I have seen a picture of another version of this model with a two tone body and a plastic cab where mine are all tinplate, so I know that there are at least two versions. Can anyone date either of these models for me? I hear they are 1950s and were number 6 in the series. They are about 7 inches long. Are they particularly rare? The plastic cab one is on ebay asking £165 and that is without accessories. By the way, although they are pretty enough, I dont rate them as practical childrens models, as the tin strip joining the cab to the back is so thin the model bends in the middle when pushed. Perhaps the later ones were strengthened? Most of what you surmise re the RAF Mountain Rescue Bedford truck is correct and I’m not certain as to how much more help I can be. Lets start with the RAF Mountain Rescue Lorry. These were the larger scale toys, around 18/19cm in length, as opposed to the Pocketoy range that Brimtoy produced and generally dated to the 1950's. Produced under the Wellsotoys 600 series banner these lorries each carried a specific product ref. no. eg: your RAF truck was model number 9/620 in the '600' series. The RAF lorry carried 2 x patients on stretchers, a spare wheel and a ladder (good to find all pieces still in place), and yes the ladder fits next to the spare wheel. You are also correct in thinking there should be a plastic aerial fitted to the nearside front wheel arch. Model also came fitted with a simulated canvas tilt. Now the tricky bit - I have come across the 600 series in different box styles although they are always all card boxes with two small flaps and one large tuck in flap to each end but differ in the colour illustrations. The lorries themselves, always Bedford models, most had cabs with tinplate lower and plastic upper and some with all plastic cabs. This I think was the simple evolution of the company moving from the earlier tinplate construction through to the modern plastic 'revolution'. The models themselves are not particularly rare although an all tin model is somewhat unusual. Nice that you have all the accessories but the box will increase its value considerably if you have it. As for £165 I wish them well ! I would have thought a more realistic figure for a complete model in todays market, including box, would be around the £100 mark at auction. As always depends on condition etc. and bear in mind that is only my opinion, someone who wants it to complete their set may put a premium price on it ! and again the all tin model would make it early, but not necessarily more valuable. Can't say I've come across the lorries bending before Tony, don't forget these were kids toys and not meant for us brutes to push around - be a bit more gentle mate ! Seriously though remember the chassis and cab do only have a relatively small area of metal joining one to the other so any 'flexing' will take place at this junction and as far as I am aware it was never redesigned. As you can see I have included a pic so others can see what we are rambling on about. Thanks for visiting and your question, hope I've been of help. David. I’ve got a collection of around 65 different Pocket toy lorries. I only collect the later ones, that is the Bedford ‘S’ type and the squarer ones. When I say I have 65 I mean 65 different ‘backs’, i.e. I don’t have the Esso tanker with the ‘S’ cab and the square cab, I just have one. I also don’t have a clockwork, a friction and a non-motorized version. I just have one lorry of each ‘back’ type. I’m sure there are a couple I don’t have. Hi there Richard, what can I say ? At least with the Pocketoys they don’t take up a tremendous amount of space, still 65 takes some doing. Just how many were produced I would love to know. I think I might start buying up Pocketoy catalogues from various years and see if I can work it out, but if anyone can give me a definitive on this it would be appreciated. However thanks to Rich we know of at least 65 ! !